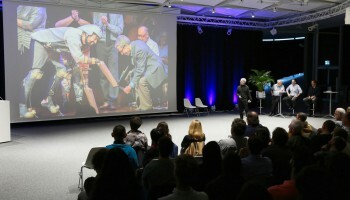 Come and enjoy, laugh and think at the Ig Nobel Award Tour Show 2018 on Tuesday March 27 at 18:00 at EPFL, to discover how using a didgeridoo can treat obstructive sleep apnoea and snoring, to learn about some particular behavior of the mallard duck, and to find out when some people would be physically capable of running across the surface of a pond. 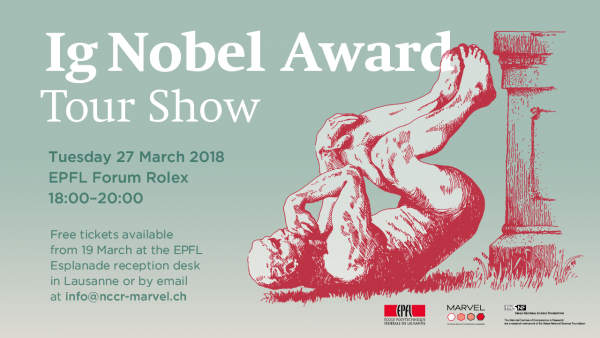 On Tuesday March 27, EPFL will welcome for the third time the Ig Nobel Award Tour Show, with Marc Abrahams and a line-up of Ig Nobel Prize winners, with the support of the NCCR MARVEL. 2017 Peace Prize winners — "Using a didgeridoo to treat obstructive sleep apnoea and snoring"
2013 Physics Prize winner — "Some people would be physically capable of running across the surface of a pond — if those people and that pond were on the moon"
2003 Biology Prize winner — "How a dead duck changed my life"
Ig Nobel Award Tour Show on 21 March 2017 at EPFL, with Marc Abraham, Ludwig Huber, Hynek Burda and Alessandro Pluchino. 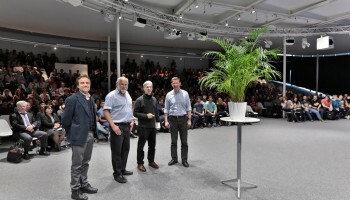 © EPFL - Alain Herzog.